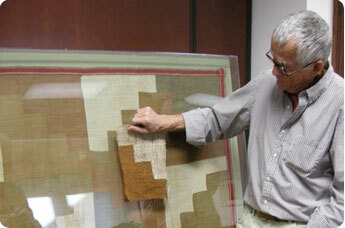 Weaver and professor Jim Bassler compares a piece of his own weaving to a textile made by the people of Nazca, Peru (200 BC-700AD). Jim Bassler is a weaver and professor. He was introduced to the textile traditions, including the hooking of rugs, at an early age from his father. The Cold War strategies gave him the opportunity to see the world and introduced him to the craft traditions of Europe, the Middle East, and Asia. The ethnic textiles that inspired him during his travels became the foundation for his work. His weavings also draw inspiration from pre-Columbian, Andean, and Mexican textile traditions. 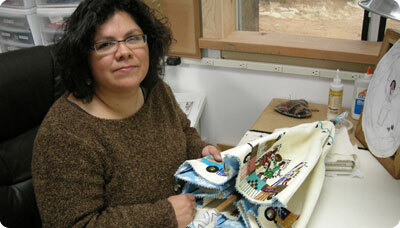 Teri Greeves is a beadwork artist who lives in Santa Fe, NM. She is enrolled in the Kiowa Indian Tribe of Oklahoma. Teri follows and updates the Kiowa tradition of beadwork, to tell the story of the American Indian, both contemporary and historical. Her works include beaded books, jewelry, and even high top sneakers! 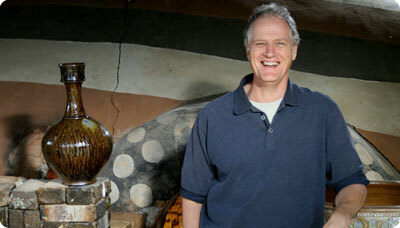 Mark Hewitt is British born potter, who resides in North Carolina. Although his father and grandfather were the directors of Spode, a fine china manufacturing company, he decided to become a studio potter instead of an industry manager. He is known for his large planters, storage jars and vases fired with the traditional Southern alkaline glaze and salt glaze. 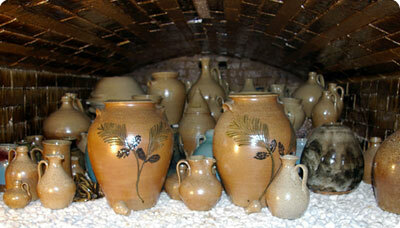 He collects and refines local stoneware clays and his work is fired in a wood burning kiln. Jugtown Pottery, a working pottery and an American Craft Shop, is located in Seagrove, NC in the community of Westmoore and was started in 1917 by Jacques and Juliana Busbee. Drawing from the tradition, Jugtown Pottery creates traditional jugs and candlesticks in wood fired salt glaze and frogskin, and tableware using local clays. Form comes first, a simple continuous line, then a complimentary glaze and occasional decoration, wood or gas fired. 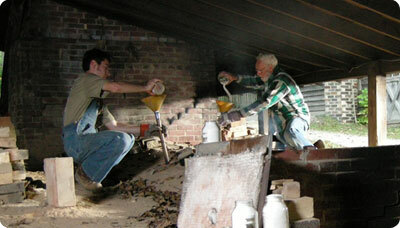 Vernon, Pam, and son Travis are the main potters, while Bobby Owens mixes clay and glazes the pieces. 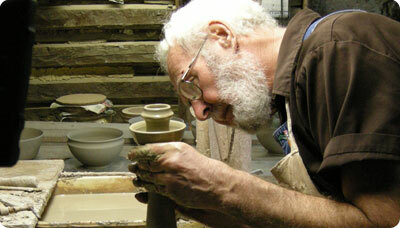 Vernon Owens throwing a candlestick on the wheel, a form which Jugtown Pottery is famous, 2008. Vernon Owens is a native of Seagrove in Moore County and his roots in pottery go back four to five generations. Vernon grew up working in the shop of M.L. Owens, his father, absorbing the style and shapes. In 1960, John Mare, the owner of Jugtown Pottery then, hired Vernon as the Jugtown thrower. Vernon continued at Jugtown Pottery through the ownership of Country Roads, Inc., a nonprofit corporation whose mission was the preservation of hand crafts. In 1983 Vernon bought the pottery and married potter Pam Lorette. He currently lives, works and sells his pots at Jugtown Pottery. 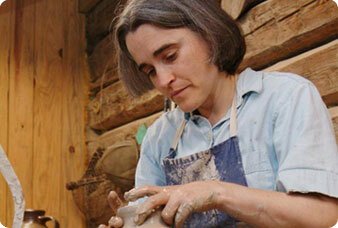 Pam’s pottery studies began with seven years of pottery apprenticeship, the traditional method of pottery study. She currently lives and works at Jugtown Pottery, making pots and developing glazes and firing techniques. She also oversees the museum at Jugtown Pottery. Pam is influenced by early American northern and southern wares as well as the classical forms that Jugtown became known for. Pam serves currently as a North Carolina Pottery Center Board Member. Travis was born in 1985 and is the son of Vernon and Pam Owens. He began working in clay as soon as he could walk and grew up learning the craft of clay from his family. Travis received a BA in Art and Design at NC State University in 2007 and works at Jugtown Pottery. 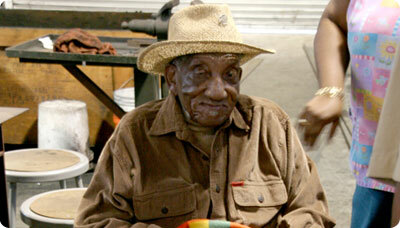 Philip Simmons (1912-2009) was a renowned blacksmith in Charleston, SC. At the age of 13, he dropped out of school and started his apprenticeship as an iron worker with Charleston native, Peter Simmons (no relation). Although his work ranges from ornamental fences, stair rails to window grills, he was most famous for his gates that contain elaborate designs of animals and trees. His work adorns the city of Charleston from end to end. He was recognized on both the state and national levels, receiving honors from the Smithsonian Museum and the National Endowment for the Arts. Paul J. Stankard is a glass artist in Mantua, New Jersey. Paul follows in the tradition of centuries-old European lampwork, elevating the practice of flamework to the highest art form of botanical paperweights. Paul lives and works in an area of southern New Jersey where glass has been produced since 1739. Working with him in the studio are his daughters, Katherine, Pauline, and Christine, and long time assistant David Graeber, who assist him in the creation of his masterpieces. 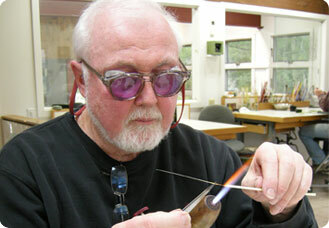 He attended Salem Community College, where he teaches flameworking.